First sautee onions/shallots in butter, then add finely diced mushrooms. Add red wine, cook until dryness. Then add cream until mixture has a whitish, creamy texture. Remove from heat, refrigerate for later use. Sear steaks, ~ 2 minutes per side, to about light/medium rare. 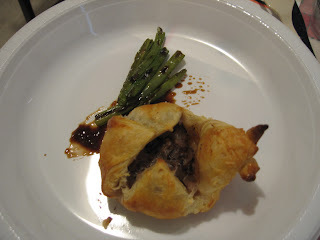 Wrap in puff pastry dough; top with previously made duxelle. Save some leftover dough to make leaves, berries for wellington garnishing. Brush with an egg wash.
Bake at 400 degrees F ~ 20 minutes. Serve with deglazed red wine sauce (from steak searing) and green beans.